Fresh baby spinach makes these buttermilk pancakes a lovely green color! When one of your toddlers is starting to get picky about her vegetables, you start to get more creative about how to get her to eat them. Enter, spinach pancakes! Please don't let the name frighten you at all - they are tasty and you really can't taste the spinach very much at all. All four of us ate them happily topped with a little plain Green yogurt, banana slices, and some real maple syrup. These pancakes have just a touch of sugar, so they aren't overly sweet, which to me makes them perfect for syrup, in my opinion. This recipe will make about 12 pancakes. We like them anytime, but they'd be especially fun for holidays like St. Patrick's Day, Halloween, or Christmas. 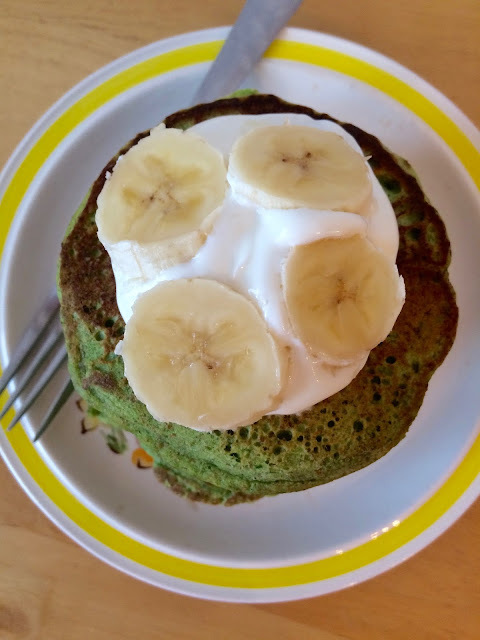 Give them a try and see what your family thinks of these fun green pancakes. 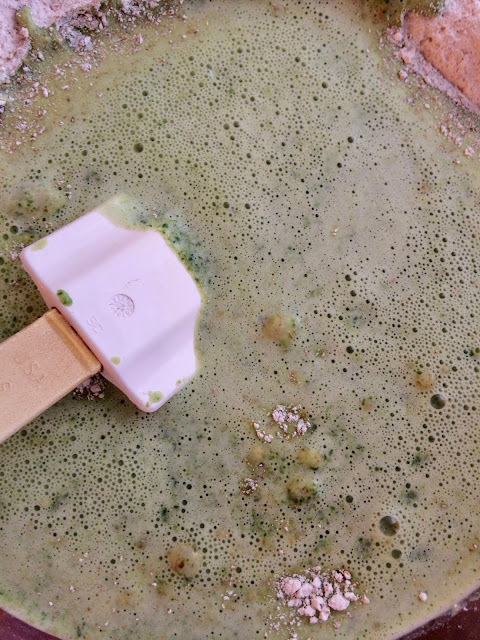 Place the spinach through oil in a blender or food processor. Blend until as smooth as possible. In a medium bowl, whisk together the flour through baking powder. Use a rubber spatula or wooden spoon to stir the wet ingredients into the dry until just combined. Heat a cast iron skillet or griddle. Rub with butter. Add the batter 1/4 cup at a time for each pancake. Flip when the batter begins to bubble and they are golden. Cook until second side is golden. Repeat until all batter is used. *If you don't have buttermilk, add one tablespoon of lemon juice to a one cup measuring cup and then fill the rest with milk. Let sit for 5 minutes before using. A great idea of using greens in the pancakes! They are really fluffy and delicious, Amy. This is such an awesome idea! I love packing veggies into my diet any way I can! What a unique recipe and a great way to work spinach into our diets! i'll try these for my son! I like adding veggies to pancakes -- we serve them for dinner, without syrup. Never thought to try spinach, though. The color is wonderful! Great idea -- thanks. Now that a sweet way to get your vegetables in the morning. I need to give this a try as I've never add a vegetable to a sweet pancake. And what a great color! I'm always getting a little hesitant when the color of a meal is too vibrant, but these spinach pancakes I will try. What a great idea! Haha...perfect for Halloween and also for St. Pat's Day. Such a gorgeous green color...these are somthing I would really love to try! 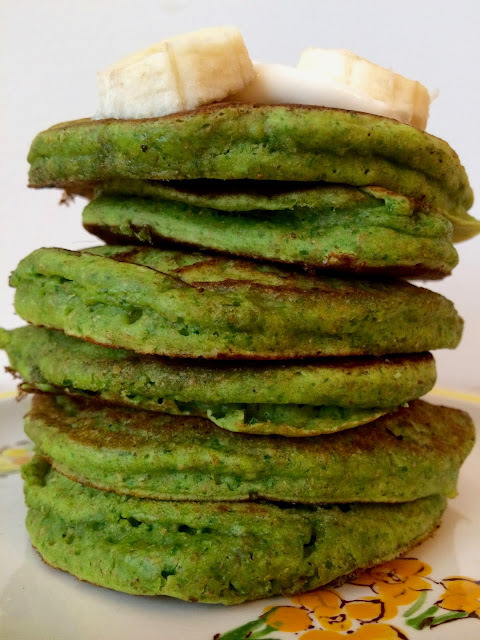 Pinning again because who doesn’t love green pancakes?! !